Let me also comment that this is without zoom, our actual location. 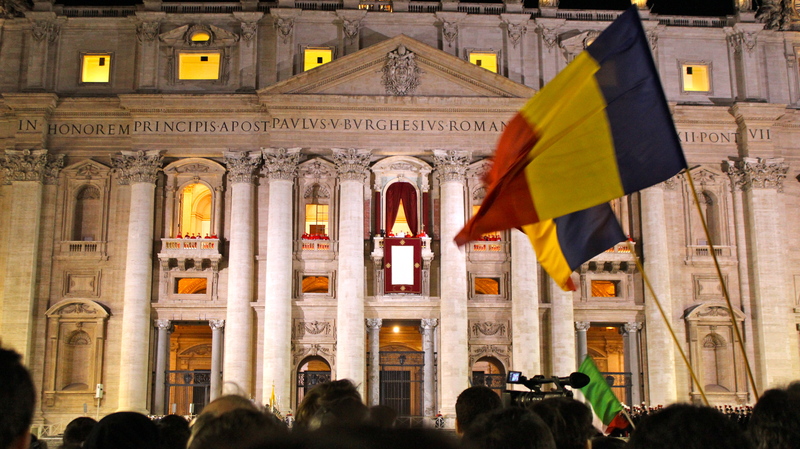 Habemus Papum, the announcement came from the balcony of St. Peter’s Basilica last night. We have a pope. The last 48 hours in Rome have been a whirlwind of anticipation and confusion. It has been an absolutely amazing time to be in this city, minutes away from the Vatican. Here I am, witness to history. If you told me when I left for this semester abroad that Pope Benedict would resign, that there would be conclave, that I would be in St. Peter’s Square to see the new pope elected, I would have called you crazy. But, here we are, with a new pope. Crazy. So, first of all, conclave makes no sense. The cardinals all come together, lock themselves in Michelangelo’s Sistine Chapel and proceed to cast votes for the new leader of the Christian world. There are no primaries. There are no conventions. There is no campaigning, fundraising, lobbying. Nope. We have no inside reports, no polls, no real statistics. It’s an election refreshingly archaic and bound in tradition. The cardinals can vote four times per day. Twice in the morning session and twice in the afternoon session. The ballots are burned for smoke after the second vote of each session, unless the first vote successfully elects the pope. Then, the ballots are burned immediately for white smoke. There is no exact timing of these votes, so smoke could happen really at any point during the day. Conclave keeps you on your toes. This means that from Tuesday evening onwards, Rome laid in wait. There was a palpable feeling of excitement. All attention pointed toward the Vatican. Traffic flowed there, so did Italians, so did tourists. Walking down the street, everyone was abuzz with talk of the papacy. Since when has a religious event received so much universal care? Well, probably last conclave. So, I went to St. Peter’s square with the countless other hopefuls and looked up at the chimney for smoke. I did this Tuesday night. I did this Wednesday at noon. I arrived at the square at 5pm Tuesday evening. The piazza filled with people as the hours passed. The sky insisted on rain. The seagull perched atop the Sistine chimney. No white smoke. Must be the second vote. So, we waited. People prayed rosaries. People sang. Mostly people huddled under their umbrellas. My toes went numb. No pope. 6:30pm: Now we were approaching the time for the second vote’s results. Cardinals prior to conclave suspected that a pope would be chosen within the first couple of days. This is it. I had called Tuesday all week. This was the time for the white smoke. Show me the smoke. Excitement grew, but so did antsy-ness. Again, more people flooded into St. Peter’s Square. We are all here together. Waiting. For a religion. Here for faith or history. But all here. Around 7:10pm puffs of white smoke escaped the chimney. Excitement erupted. Screams, cheers, the crowd surged forward. Cameras out immediately, exclamations. Umbrellas down. News crews. Pope. A Pope. We crammed ourselves up to the balcony. Center, fairly close up. Very close, actually. I guess that’s the payoff of 3 hours in the rain. I instantly had goosebumps. I was shaking (maybe from the cold, probably from adrenaline, mob mentality, something). The bells began to ring. They did all over Rome. This lets the Romans know they have 45 minutes to make it to the square. “Drop everything,” they ring, we have a pope. Now, the waiting game. The guessing game. We have a pope, but we don’t know whom it is. The elected pope dresses in his new pope vestments. He prays. Maybe he gets sick. I don’t know. He’s about to meet his masses – He’s about to have the biggest moment of his life, but also the most humbling. The Italian woman next to us says it can’t be an American – an American would be out here already. He must be Italian. Italians move lentamente. 8:05ish pm: the pope emerges to cheers and shouts and song. He is announced in Italian, Pope Francesco. The priests behind us give us information that permeates the crowd. Argentino. Jesuit. Bene. Bene. And then His Holiness speaks. He opens with a joke about being a non-European. (This guy should know he’s already won the crowd.) He asks us to pray for him. He prays for the people. He prays for us. And we receive his first papal blessing. And, it’s magical. The square, full of thousands, is silent. With a political election, there is a winner and a loser. One group is happy; the other, defeated. There is promise, yes, but there is also already dissension and opposition. Here’s the difference with conclave: we may have a favorite cardinal, we may have opinions about where he is from, but there are no losers. There is all excitement. We are all excited. We are all looking forward. Promise. Hope. Life. Direction. New direction. It was absolutely one of the most amazing experiences of my life to be in that square, to see Pope Francis, to wait with believers, with nonbelievers, with religious and lay. It was the biggest thing that I have been a part of, as a Catholic and as a person. I was there for history; but more so, I felt the promise for future religious life, future global life. Sincere love and solidarity. The square was full of sincere emotion last night. Genuine. And, that is something spiritual, or religious, or something. It’s rather indescribable. He was so right. Viva Papa Francesco.